Danielle Daws: Introducing Bronte... Our (Now) INSIDE Cat! Not anymore! Since moving into our new house in September, Bronte has been rescued from a stormwater drain not once, not twice, but THREE TIMES!! The first time he was rescued by the RSPCA after a night in the drain, the second my hubby retrieved him after a couple of hours. Both these times he was in the pit under the manhole - the pipes were too small for him to get through. So although it wouldn't have been pleasant, he was reasonably safe. 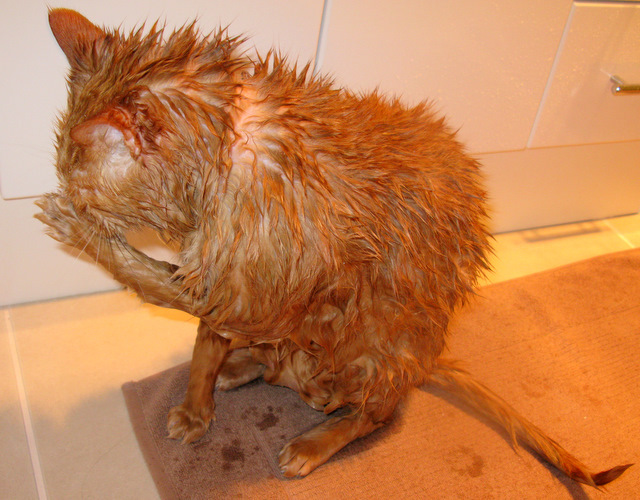 If any of you have ever bathed an unwilling cat, you'll know it's not fun! And since Bronte's needed THREE baths in the past couple of months, we thought we'd try him in the shower. So much easier! No scrambling to try and get out, just aim the water wherever he walks. 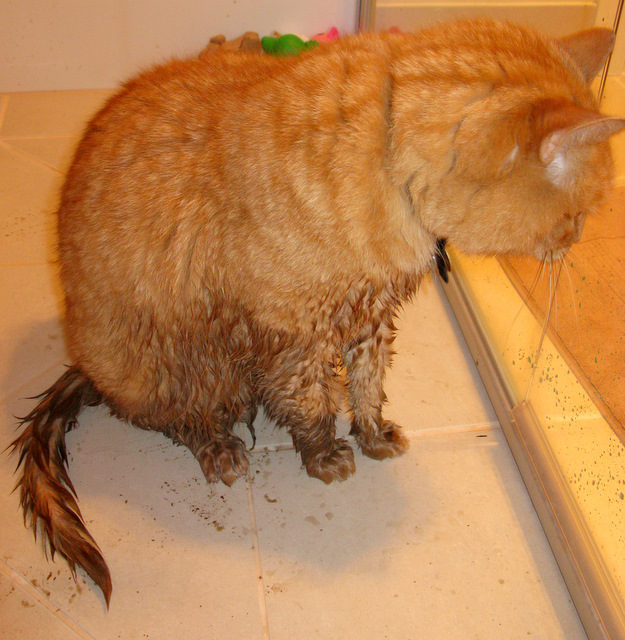 We tried the shower the second time he came out of the drain. Today he needed a LONG shower! Content (ish!) 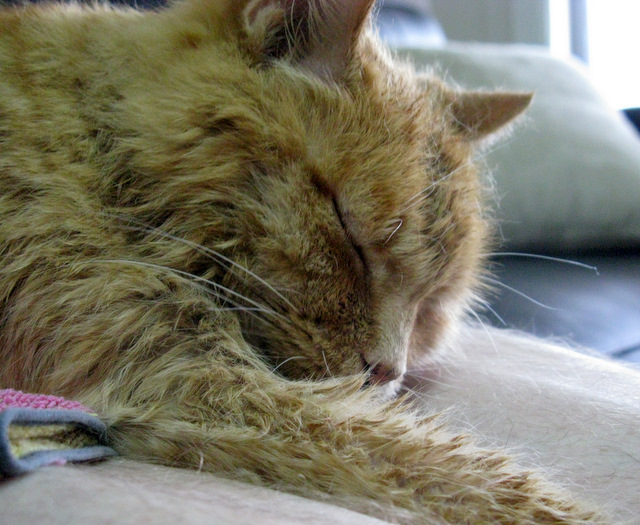 and curled up on hubby's lap. He'll be ultra-clingy for the next couple of days. LOL Geez he does get around doesnt he. :) I think you better keep the door locked before he gets himself stuff somewhere you cant find him. Awww poor thing. I hope he doesn't get into any more trouble! How cute, I hope he stays out of trouble. Ohh the shower idea sounds good! I might have to try that myself. I'm glad that he is safe and sound. Oh, Bronte uses the same shampoo that I use...lol! Poor guy, hope he wasn't traumatized be these escapades. I'm so glad that he's safe and dry, now. 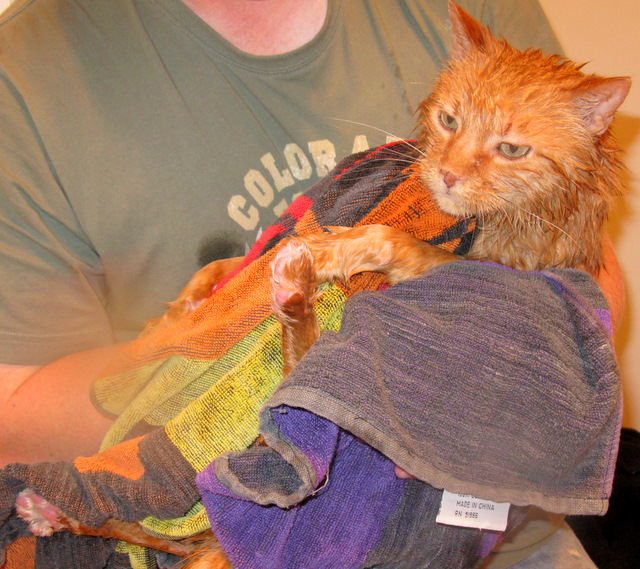 Oh, I'm glad he is safe now but he looks mighty unimpressed wrapped up in the towel. I could think of so many more nice places to go for an adventure. Luckly he is safe and sound now.